Yaesu FT-817: A 5 watt transceiver that's relatively recent (it has been superceded by a slightly enhanced FT-817ND). It has the optional temperature controlled crystal oscillator ("TCXO") installed. Icom IC-746 Pro: A current production 100 watt transceiver that is typical of mid-range ham rigs. It uses digital signal processing ("DSP") for its filtering and other functions, but is not a Software Defined Radio. It also has the optional TCXO installed. Flex-Radio SDR-1000: A 100 watt radio that is truly an SDR. All signal processing is done in a host computer using a sound card for digital-to-analog and analog-to-digital conversion. 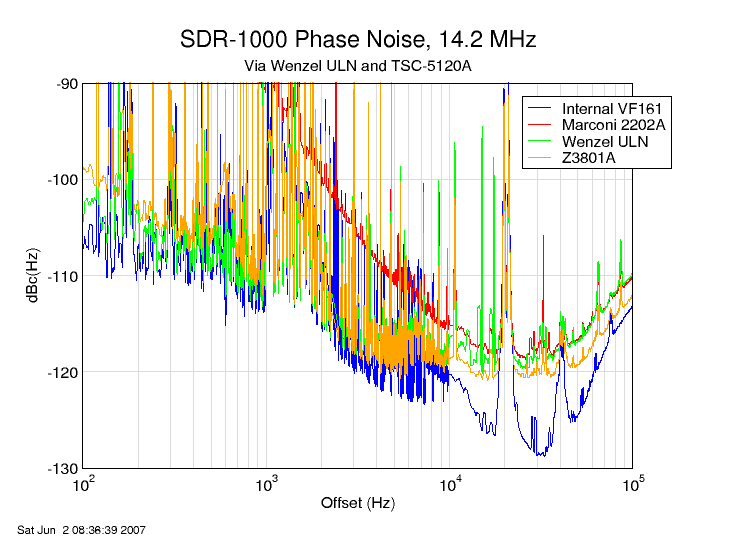 The rig comparison plot shows the SDR-1000's performance using its standard 200 MHz internal oscillator. The SDR-1000 tests were performed with an M-Audio Delta 44 sound card; I suspect the spurs seen on the SDR-1000 plots come from noise in the the host computer transmitted via the analog audio cables. Kenwood TS-520S: A 1970s vintage 100 watt transceiver that uses hollow state devices (vacuum tubes) for its power amplifier, and has no synthesizer at all -- it uses a VFO (variable frequency oscillator for you youngsters) in a traditional superheterodyne configuration. In each case, I set the rig to generate about 20 watts output in CW mode (except for the Yaesu FT-817, which was set to 1 watt) and fed the signal through appropriate attenuators to put about +3dBm into a TSC 5120A phase noise analyzer. The phase noise reference source was a 5 MHz Wenzel Ultra Low Noise oscillator. Each transmission was about 5 minutes long, a compromise to get enough data while not overheating the rig. If you are unfamiliar with phase noise plots, the Y axis is the power contained in a 1 Hz bandwidth, referred to the carrier signal level. The X axis is the frequency offset from the carrier. Note that the X axis is logarithmic, so close offsets are spread out much more than distant ones. The following charts are animations that hold on each frame for 3 seconds... be patient and you'll see the whole thing! (If you'd like to see the individual images, they are here. What do these plots tell us? Well, for very close offsets (less than about 10 Hz), a good 10 MHz oscillator can have much lower noise, even after multiplication in the SDR-1000's DDS chip, than the internal 200 MHz oscillator. From 10 Hz to about 10 kHz, a very good oscillator like the Wenzel can be a bit better than the internal oscillator, while a more normal oscillator like the Z3801A is slightly, but not dramatically, worse. From 10 kHz on out, the noise generated by the DDS masks the difference between different 10 MHz oscillators (except the Marconi, which is shown as a worst-case example) and the internal oscillator can be as much as 10dB better. But, there is something in the SDR-1000 that causes the phase noise, no matter what the reference, to increase starting at about 30 kHz offset. At 100 kHz offset, the internal reference only has a couple of dB advantage over the external references, and even the Marconi performs as well as the other references. Unfortunately, my test system only goes out to 100 kHz offset, so I don't know what happens further out. But some of John, K2OX's measurements show what appears to be a similar bump, and his measurements, which go out to 1 MHz, indicate that the noise starts going back down at about 300 kHz offset. It almost looks like there may be another PLL involved, with a 30kHz bandwidth that operates whether or not the DDS frequency multiplier is being used.